In an era that seems dominated by cynicism and corporate greed, the story of some Nissan engineers spending nights and weekends to restore a piece of automotive history “just because” is enough to lift anyone’s spirits. 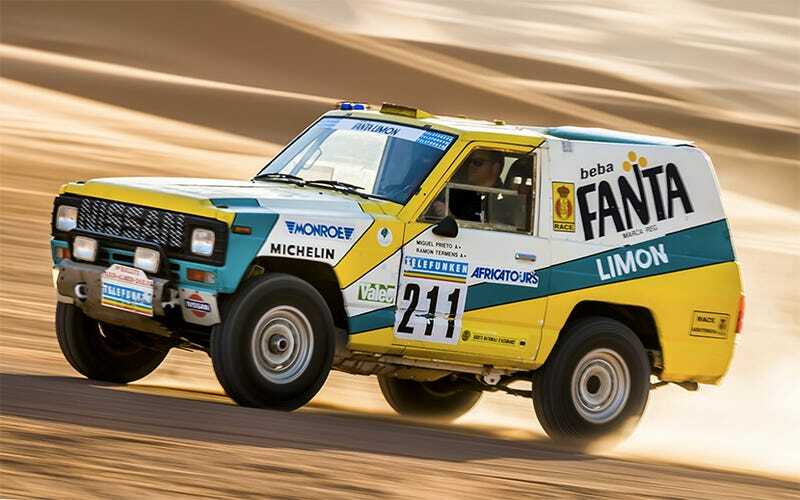 Behold: the 1987 Nissan Patrol Fanta Limon Paris-Dakar rally car, returned to its former racing glory. The ’87 Patrol isn’t a particularly elegant or technologically distinct vehicle. But apparently some Nissan engineers saw it on a forum somewhere, realized its 30th birthday was coming up, tracked it to a private car museum in Barcelona, Spain and decided to give it a top-to-bottom rebuild for the simple appreciation of what it is– a badass little racing rig and a snapshot of automotive history. “This is our heritage, and we think it’s worth it to bring it back to life,” Nissan Senior Engineer Dario Fernandez explains in the video above. The Patrol had been languishing static for some 28 years, and apparently wasn’t exactly ready to rumble when Fernandez and his crew first got their hands on it. “The engine was in terrible condition. It was impossible to start and many parts were heavily corroded. The front axle was quite damaged, but the worst thing was the electrics, which had been badly attacked by rats,” Nissan tech Juan Villegas said in a press release. This truck’s 2.8-liter four-cylinder turbo diesel engine was originally rated to 146 horsepower, which could supposedly take the 3,500 pound vehicle to a little over 93 mph. I think you’d run out of suspension travel way before that speed in man sections of the original Dakar rally, but it would have been wild to ride in regardless. Fernandez, Villegas and others spent months of “spare time” bringing this Patrol back to life. One Nissan staffer, Pedro Diaz Illan, was around when the company originally built this Patrol. He did the vehicle’s electrics in 1986, and today manages the electrics department at Nissan’s facility in Spain. As far as this particular vehicle’s racing resume goes, it’s not particularly long but it is hard-earned– the truck completed the 1986 Tunis Rally, Baja Aragón and Raid Pharaons. And most impressively, finished 9th overall in the 1987 Paris-Dakar Rally. That of course was when the Dakar Rally actually went to Dakar, specifically running some 8,000 miles through Europe, Algeria, Niger, Mali, Mauritania and Senegal. I’m not sure what Nissan’s long-term plans with this little rig are, the Dakar Rally doesn’t have a Vintage class (what an idea though, right?) so this Patrol will probably go back to another museum eventually. But I love the fact that it got one last romp in the African desert thanks to the genuine enthusiasm of a few corporate car engineers. On top of that, I might have a new favorite retro race car livery now.